The colours used in historic tapestries make no attempt at naturalism. The choice of bold colours is consistent with what they were trying to achieve in the design. The colours would provide the contrast and focus for the overall design. 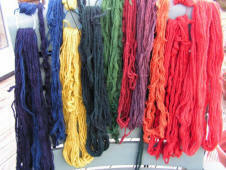 Although a limited pallet of about eight dye-stuffs has been used, with various shades and intensity and over-dyeing there is a good spectrum of colour available for the embroiderers. The dyers were certainly masters of their art as they only employed dyes that were know to be stable. The fastness of the colours they used is truly remarkable. Those lucky enough to have inspected the work report that the colours within the threads and on the back of the Tapestry are still vibrant. 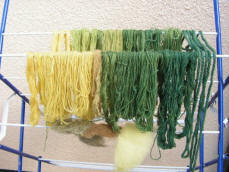 The dyers avoided the use of pale or very dark colours, which are hard to achieve and not particularly stable. The original colour scheme, with blue or green horses and multi-coloured boats, works really well, so the same colour scheme has been followed in the Fulford Tapestry. In the subdued lighting conditions encountered in buildings in medieval times, the colours would not have been fully appreciated. In the evening light, greens remain visible after reds and blues have blended into shades of brown.